If Romeo and Juliette left you teary-eyed, wait till you hear Helen and Kampachi. Some tragic love stories take place on the streets of Verona, some in Egyptian palaces, and some in Boston fish markets. I didn’t know what intrigued me more – the hefty price tag, or “FARM-RAISED” advertised in such big letters. All fish at Marden’s are labeled with either “farm-raised” or “wild”, but on most tags it is the fine print, not the headline. Considering how many times I’ve seen customers change their mind about a fish once they saw the “farm-raised” label, I was surprised Marden’s would emphasize it. Unfortunately, Kampachi and I weren’t properly introduced. If the Captain (Marden’s owner), or Tom (one of his knowledgeable fishmongers) would have been working that day, they’d give Kampachi a proper introduction listing its merits and accomplishments in the culinary world. But since neither one was around, I took a chance and asked the fishmonger on duty what Kampachi was like. “Hmm … it’s kind of like swordfish,” he replied with so little confidence it was obvious he’d never had it before. Guys like this don’t make my mantra of “just ask your fishmonger” very convincing. I wish they could honestly say when they have no clue. 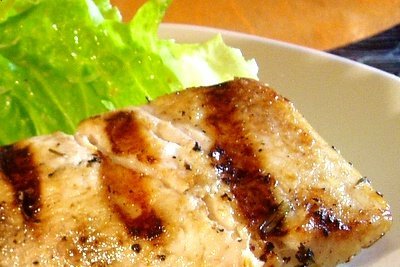 Kampachi fillets were no bigger than a red snapper, so it wasn’t likely to be as dense as a swordfish. Of course, there are some smaller fish that are firm (like grouper), but they tend to have a thick and rubbery skin. Kampachi’s looked fine and delicate, similar to salmon. Now I really had to have that fish if for no other reason than to prove that it had nothing in common with swordfish. I can’t help being Miss Smarty Pants of Fish. When I brought my catch home, I gave it a sprinkle of salt and pepper, a light coat of oil, and then grilled it the usual way. The results? Simply fantastic! This fish had the silkiness of sable (a.k.a. black cod), but with a more savory rather than sweet flavor. It’s too bad my picture doesn’t do it justice. I took one in a rush thinking that if it turns out to be a good fish, I’ll buy it again and will have plenty of chances for more pictures. Little did I know that I might never see my dear Kampachi again. The next morning, I googled for “Kampachi.” Turns out this Hawaiian fish has been delighting sushi and restaurant chefs since its arrival on the food scene in 2005. It’s a descendent of a wild fish called kahala. Kampachi’s flavor and texture is often compared to Hamachi (yellowtail in English). I believe that Kona Blue, the company that breeds this fish, came up with the marketing name Kampachi by combining Kahala with Hamachi. The reason you haven’t seen kahala (the wild fish) in your local fish market is that it’s prone to ciguatera toxin harmful to humans, so don't go fishing for it. But the controlled diet fed to the farm-raised version of this fish makes it not only perfectly safe but fatty and outrageously good. Maybe that’s why Marden’s was emphasizing the “farm-raised” part. And did I mention that it passes mercury and PCB testing with flying colors? That’s the maximum Omega-3 fatty acids with the minimum of mercury! Most chefs prefer to serve Kampachi raw or rare; unfortunately, I didn’t know that when I first bought it, and sashimi is not something I do on my first date with fish. I try to give us a chance to get to know each other before getting serious. But by now, I was madly in love and couldn’t wait to taste Kampachi’s cool, creamy flesh over a bowl of rice, or better yet – seared quickly to crisp the skin while leaving the inside rare. Without further ado, I called Marden’s to place an order for Friday. Can you believe my devastation when they told me they had no further plans to carry Kampachi. They said the distributor raised the prices and that they had a hard time selling it due to people’s unfamiliarity with the fish. The sad truth of the fishing industry... There are always new fish to discover, but you can’t get attached to any of them as the cruel fate of supply and demand might separate you forever. As long as everyone is paying $20/Lb for wild king salmon with no questions asked, what fishmonger will want to bother with an expensive fish that might not sell! Handing out samples might have been a better marketing strategy than a “New! FARM-RAISED” sign, but what do I know about fish marketing. All I know is that there is nowhere to buy Kampachi in Boston. At least not right now. Here is the recipe for the dish I never got to make. How do I know it works? Trust me. I know. If you ever see Kampachi, give it a try. Prepare 4 serving plates by drizzling them with a little lime vinaigrette, chive oil, or a cold sauce of your choice. Pretty much anything herbal and/or citrusy will work. In a small bowl, toss the radishes with a splash of lime juice and a pinch of salt. Dry the fish fillets well with paper towels and cut into 4 pieces. Set a non-stick or well seasoned cast iron skillet over high heat and wait for it to get hot. Add the butter and wait for it to melt. Sprinkle Kampachi with salt and pepper on both sides and place in the skillet skin side down. As soon as the skin browns, 2-3 minutes, remove the fish to serving plates with the skin facing up. No need to check for doneness as the fish should be rare. Sprinkle with radishes and chives. Then open a good bottle of Riesling and have a wonderful meal. Just don't forget to e-mail me with the details of your feast. Fish substitutions: none of the other fish will taste quite like Kampachi, but this recipe will work with arctic char, salmon, sable, striped bass, red snapper, and many other fish that are either delicate or can be eaten raw like tuna. If using a substitute fish, cook it on both sides (starting with the skin side). Salmon, arctic char, and tuna will taste best if left rare in the center. The other fish should be cooked through. Dallas doesn't seem like a very likely place for Kampachi to turn up either but I trust you on the recipe. My boyfriend's son-in-law works for Kona Blue in Hawaii - I'm sure he could tell you where you might find some more. Your pictures are always stunning. Great story, sorry to hear I missed it, and that they didn't advertise better, and that they're not going to continue taking risks - that's what keeps non-franchise businesses in business (God I hate Whole Foods fish), something we need in Boston. I may be wrong, but 'kampachi' may be the Japanese name for the fish. It's been around for a lot longer over there than 2005, and they have a character for it and everything. It sure is yummy though! Wow, $19 for farm-raised fish. From the Kona Blue website they do seem to be the poster-child for "sustainable" fish farming, but still....$19 a pound from a fish farm? Emmy, thank you so much for the useful info about Kampachi in Japan. Do you know if it's farm raised as well? Jared, I know that $19 seems high, but if we get over the media hype, farm-raised fish does not have to be inferior to wild. Just like farm-raised beef is no worse than wild buffalo. I agree that there are environmental issues to consider when it comes to farm raising fish, but taste has really nothing to do with it. You know, I don't--but I'll definitely try and find out next time I'm back home. I find that the fishmongers and supermarkets in Tokyo (the ones I've frequented at least) don't seem to advertise very heavily whether they are farm-raised or wild... perhaps it's just a difference in culture, not placing such an emphasis on where the fish come from? Not quite sure, but I'll be more attentive when I head over there again. Our family is on Kauai at the moment, and we've now had Kampachi on the grill twice, sprinkled with some Alaea sea salt (reddish, local) and brushed with a bit of macademia oil (also local). The fish was new to us also. We got it from the Dolphin fishmonger's in Hanalei. It's truly spectacular. An exquisite fish, perhaps the best I've ever had. (We live it Seattle, and eat good fish often, so this counts for something.) In addition to a firm but succulent and savory flesh, the thin skin crackles deliciously. Great to hear this is farmed sustainably. Nice post! Kampachi really is amazing. I have recently prepared it both raw and cooked, and have fallen in love with the fish. Yep, it certainly isn't cheap, but this is a really high quality fish. It is a shame to call it "farm raised" because that really does present a bad image. These guys seem to be trying their best at doing fish farming that isn't completely crap for fish and the environment. him: "no mate, that is tuna". I could be imagining this, but I *think* I overheard someone buying kampachi at New Deal last week. I was too excited about my sable to pay much attention, and it was in the middle of several fish names in Japanese, so I could be very, very mistaken, but it might be worth giving them a call. But next time I am at ND, I'll ask. Wow, amazing that you could quantify the deliciousness of a fish by price. I like Kampachi as sashimi. I think it should also taste good in capaccio. Never tried it cooked though. We are going to start selling kampachi online tomorrow after we had it crudo style at Ki in San Francisco. Can't wait to try your recipe! ps: love your writing style!